Kids Create: Scented Gingerbread Man Christmas Ornament – …. Get ready to deck the halls with AdTech’s NEW collection of SCENTED hot glue! Easily create festive felt ornaments with cute and fun detailing with the help of the AdTech Precision PRO hot glue gun. This is a great craft to keep the kids busy and it also makes a great last minute gift for them to share with their friends. Step 1. Gather up your supplies as shown. For this project I worked with the Christmas Tree scented glue sticks. This way the ornament will add a realistic aromatic scent to our artificial tree! Plus the scent brings back so many nostalgic holiday memories! You could also make ornaments for your holiday décor in any of the other scents available, such as: Apple Cinnamon, Pumpkin Pie, or French Vanilla! Step 2. Trace out two gingerbread men onto your felt with pencil. If you do not have a gingerbread man stencil, you can use a cookie cutter, or make your own stencil from a picture found on the web. Step 3. Cut out the two gingerbread men. Carefully glue the edges of the two pieces together, leaving an opening at the neck. Step 4. Cut a 5” piece of coordinating ribbon and glue it in place between the two layers as shown. Get ready for the lovely aroma of the scented glue to fill your craft room as you work and put you in the mood to celebrate! Step 5. Stuff the body of the gingerbread man with fiberfill. Use the back of your pencil to make sure you stuff each of the arms and legs well. Step 6. Carefully stuff the head and seal the remaining edges of the gingerbread man. Step 7. Now you are ready to begin embellishing! Cut out the decorative accents out of coordinating felt. Use pinking shears for the icing on the arms and legs for a cute handmade look. Feel free to make it your own by adding your own special touches. For this guy we added a green bowtie and two white pompoms for the body. Step 8. 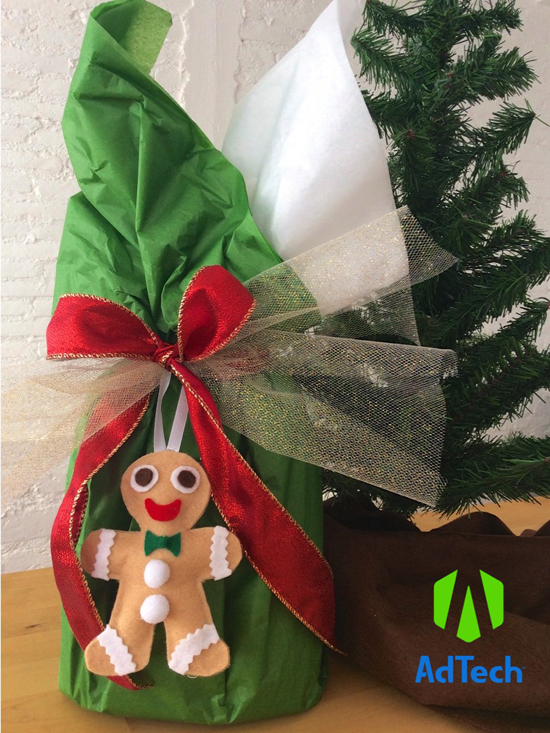 Dress your gingerbread man with the AdTech Precision PRO. The precision tip nozzle is perfect for this type of fine detail work!